In 1939, on the eve of the start of World War II, the prevaling sentiment in America was against "foreign involvements". The handwriting was on the wall, Hitler's armies were poised to invade Poland, and few people who cared to regard the realpolitik in Europe could doubt that eventually our interests and those of our allies (Great Britain and France, etc.) would converge, drawing us into another global conflict. 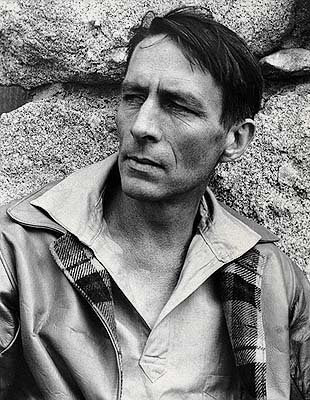 It is in the context of this general mood, then and now, that we consider a timely "anti-war" poem by Robinson Jeffers, an unconventional and independent-minded American poet living out along the far Western edge of the continent, in a stone house he'd built with his own hands, an "isolationist" whose opposition to our participation in the Second World War would seriously influence his literary reputation. A mortal splendor; meteors are not needed less than mountains: shine, perishing republic. Despite its somewhat elegant and slightly archaic rhetorical phraseology, the poem speaks quite powerfully to our present predicaments, albeit from an isolationist's point of view. Addressed ostensibly to his own sons, it is also a cynical shorthand for Jeffers's general stand against national wars: He stood against the tide of commitment which accompanied America's entry into the War, and was ruthlessly vilified by literary critics in the years following. Yvor Winters and Kenneth Rexroth, in what must be regarded as a shameful display of turncoat Toryism, both sought to savage his reputation. But I didn't post this poem just to resuscitate Jeffers's reputation (or to praise this relatively minor poem), which I suspect will stand or fall despite whatever I may have to say about it. What interests me are the ambiguities in the poem, which may, on first or second reading, seem simple enough, but which, on further examination, reveal contradictions and subtleties which probably undermine the poem's commonly accepted meaning(s). You could take the poem's sarcastic irony--beginning with the title--to signify a hackneyed anti-war or anti-republican stance, a commonplace revulsion with the vulgar capitalist energies which characterized mid-20th Century America. Getting and spending, the intellectual bigotry of believing one's nation to be a superior exception, untainted by the evils of history's other failed empires. But it isn't America's energy, or optimism, or vanity, which Jeffers is damning; it's its "thickening," its "hardening," its rotting decadence, its corruption of feeling and principle. America was founded on dignified, worthy investments: In individual liberty, the common good, fairness before law. Jeffers offers his encouragement: "Life is good...a mortal splendor." His greatest reservation, offered to his sons, is expressed as a caution: Avoid the "center" in cities, escape to "the mountains." Yet the last stanza offers a new level of ambiguity. Jeffers shifts the terms of the argument from a dialectic between patriotic loyalty and optimistic endeavor, to the master/apprentice relationship. Whereas he had previously posited the family unit (a man and his sons) in opposition to the state, society and the inertia of progress, now the dilemma is between the obeisance of the slave (or progeny) to the Elder, or "Master." Is Jeffers suggesting that Jesus--God's "son"--who "walked on earth" became an immoderate "slave" of his "Father," God? Or is it that Man was caught in God's "trap?" It's an intriguing ambiguity. Is Jeffers suggesting that he, as the Father, occupies the same position of authority to his sons, that Man has in relation to his God? Or is he suggesting that Jesus's vanity made him a toady to duty and homage to the ultimate "Master"? It's almost as if Jeffers is taking an Olympian position, over Man, and the universe, observing that Man is merely a "clever servant, insufferable master." That--indeed--it is Man's tendency to worship faithfully--to observe the faith--which makes him most susceptible to the suasions of obedience, of blind faith. The poem is not really about patriotism during wartime--or not so simply--but about the relationship between Mankind and the justifications it sets up, about the priorities which we idolize and emulate, and standards we carry into strife. Don't over-love, or over-trust, people. Be neither servant nor slave. God/Jesus had too much faith in people. It was too early. I meant to say "be neither servant nor master". It's Polonius-like, but still good advice. He's saying that God was caught in man's trap (caught by the rabbis, caught by the Romans). He's saying that people are icky, but nature is nice. Of course this is all bunk. He has gotten everything wrong! Jesus knew what he was getting himself into, and he was trying to make himself into a permanent symbol of what's wrong with humanity. He saw it all the way through to the end, even knowing that it would be Judas who betrayed him. Kirby: We get into the predestination versus free will thing, with God setting up the game and then watching the puppets dangle. Isn't all that really pretty silly? Jesus was just trying to turn himself into a martyr. It has some use, but as a "permanent" symbol? That's as stupid as feuding Middle Easterners, fighting each other for thousands of years. Anyway, Jeffers isn't trying to "get everything right" to suit your religious affiliations. He's writing a poem, one which encourages the next generation to be skeptical, even of the law-givers. It's excellent advice. Jeffers had no illusions about the "niceness" of nature. He surely found the dynamics of nature more true and authentic than the bulk of human activities, but he was also aware of its absolute indifference, emotional coldness, and "cruelty". I think as a young man he leaned towards a Keatsian/Romantic view of nature, but he didn't retain it. I see no problem with a personal god. In fact I see it as a kind of pinnacle of the human imagination, but it should stay personal, i.e. unvoiced and private, and not institutionalized and dogmatically spread. Something so personal by definition can not be transmitted to others, except indirectly by its influence on our characters and actions. Oh, I love the church. It's such a lovely institution, and I think it's important to demand conformity with its dictates. The church is the superego, and it dictates shoulds. Everything else is the mindless id of contemporary culture egging us on to further monstrousness. I see nature as essentially monstrous, with only the superego holding us back from behaving like monsters. The only thing worse than a chimp is a French theorist who's read too much of the Marquis de Sade. So I suppose we have a bit of the spectrum here, from the absolutely willfully perverse, to those who believe in personal restraint and objective decency, as it has been formulated and handed down from Christ's church. I still think Jefferson is a pretty interesting poet. He's just got everything backwards, from what I can tell. Has he got any poems where he tackles the church head on? Then we could get his perspective on all that straight from the horse's mouth, so to speak. Humankind can theorize all it wants--they still have to eat, eliminate, sleep, fornicate, exercise and groom. Shall we debate the angels on the head of a pin? Georgie, yeah, he can probably be viewed as a descendent of the Romantics, but as you point out that might not mean anything too specific. Possibly descended from Blake and Shelley, yes, but not Keats, even though I know he was fixated on him early in life. Keats was a natural pagan first and foremost, almost pantheistic, very rooted in the earth, but there's also a visionary fairy tale tinge to his view of nature. For Blake Human Imagination was God and Reality, with everything else at different degrees of remove. Maybe Jeffers is Blake without the metaphysics? I think Jeffers tried to disrobe himself of everything but nature's monstrous forces. I don't know if he succeeded. His mature view was so dark and bitter in regard to humanity. I think he would've metamorphosed into a California condor if he could've... That type of present tense ahistorical soaring was his mysticism. Actually, I think he would have preferred to be eaten by a hawk. Georgie, You should speak for yourself. Unless you meant that Odysseus would take me seriously. I think Robin Jefferson did write a nice piece or two about nature. I read something about rocks and geological ages, once. What a nice poem it was. It reminded me a lot of Gary Snyder. What would be Gary Snyder's relationship/ or take, on Robins Jeffersonian? Also, is he named after Robinson Crusoe? What would be your position on the implications of the discoveries and demonstrations of science upon the ancient "verities" of religion? Putting aside the fine point of claiming that all language is a facility with elaboration--simply using different terms--don't you acknowledge that the progress of history establishes a time-line of development of knowledge that obsoletes misconceptions and primitive delusions? Curtis, Luther said that science should be totally free in terms of its own domain. Therefore, freedom of inquiry is something that I believe should be absolute. But inquiry has to start with certain concepts, which are axiomatic, and taken on faith. The ten commandments I see as universal frames of value -- they can neither be proven nor disproven scientifically. You either believe that it is wrong to steal, kill, and commit adultery, or you just think anything goes. Laws in America and in most of Europe are based on the ten commandments. There is no reason to think that they are valid, but they are still pretty good principles. Better than, say, do what thou wilt, for example. Which is the only principle in nature. Which means that adultery, murder, and theft, are fine. Do you think those are good principles? If you do, and if you live within them, it makes for chaos. Values are separate from science, and obviously guide science. Or have always guided science. I think science is value-free. It's just a MODE OF INQUIRY. At any rate, no, I don't think the values of Christianity have in some way been rendered obsolete just because science cannot prove the rational existence of God. Paganism a la Nero, which is where the new secularism is going, is also gaining adherents, but they are getting viral diseases, and so tend not to last very long. They die almost as soon as they are born. Jeffers' philosophy (which I don't claim to understand, but which seems perhaps to come out of Nietzsche or Schopenhauer?) didn't make him happy, or able to cope, or form a decent community with other human beings. Isn't this a rather negative and useless philosophy. On the other hand, I just had a lovely week with my co-religionists during Easter. What peace and joy! I feel better every time I go to church. Because of the values -- of which I don't think science has anything to do. Call me crazy, but there are two billion of us, and growing. Kim Jong-Il also has scientists in N. Korea. Science is kind of just a tool at the command of whatever master. Science in and of itself, is not much. The Nazis had very good scientists working for them. Brilliant scientists like Heisenberg, and many others. They made brilliant rockets which blew up half of London. Science doesn't impress me much. I'm thinking of a line that Charles Ryder says to young Lord Brideshead in the Waugh novel. "You manage to make quite ordinary notions sound like sheer nonsense." The a priori method of thinking is the opposite of science. Without science, Kirby, you'd probably be dead today, as perhaps some of your children. At the least, you'd be without teeth, pock-marked from fevers and infections. You'd be leading a donkey across a waste, looking for food and worried about the weather. The luxury you bask in is courtesy of patient, careful science. Not religious dogma, not reactionary anti-intellectualism. Sometimes you reference Locke and reason, other times you favor blind belief. You need to resolve these contradictions in your nature. Faith to me is an adherence to the truth of an absolute mystery, a belief in something utterly beyond intellectual proof, so by its very nature it is profoundly uncertain on an intellectual level. To adhere to the intellectual constructs of an institution, as fundamentalists of all stripes do, is not faith. To have "faith" in these constructs is mundane knowledge like any other mundane knowledge. But then I'm not one to attach myself to institutions. This isn't to say that this mundane knowledge can't increase the quality of life of people who adhere to them. Curtis, science is guided by values. I'm not against it, I'm only saying that it can't create values. Religion can, that's why it's important. You're confusing ethics with religion, like people do when they throw the philosophy and religion books together on the used book tables. Ethics is the study of conduct and value(s). Religion is a misappropriation of ethics. Organized religion has, really, nothing to do with ethics as such. It's a body of superstition concocted over time by crackpots. Religions are a dime a dozen. There are hundreds of them. Take your pick. Most people "choose" religion because their parents shoed them through the church doors. This is moral choice? Indoctrination and adherence to principles without question. These aren't the tenets of the Age of Reason. They're the province of fools. Organized religion is a pot-luck dinner, not Plato's Symposium. Religion is hardly indoctrination without choice. The confirmation process occurs in the teenage years and many young people leave at that point. You can freely leave Lutheran congregations. There is no charge of apostacy. You have to feel that you were called by God. We don't evangelize. I'm not, for instance, trying to make you into a Lutheran, but simply trying to get you to be a little more flexible in your perceptions. Reason needs concepts and concepts have to be created on a cultural basis. Cultures aren't founded by science. Science is merely a procedural method. Science can be used by someone like Albert Schweitzer, or by someone like Joseph Mengele. They are both using science: one is using it to heal whole peoples, another is using it to destroy whole peoples. It's just a procedure. It's the framework of values around it, that makes it either life-giving, or lethal. Frameworks of values are created through religion -- religion is not a monolith that comes like a hammer to make everyone identical. There are enormous controversies inside of every church, and even inside of every congregation, and even inside of every congregant. No one is asked to not think! Luther was all about everyone being able to think for themselves. We have no Pope, and we have many different tendencies, even within the same person. Freedom of inquiry is an absolute. Luther never bothered with science, but he did argue that it was its own field, as was art, as was transportation. There was no such thing as Lutheran automobile repair. It's free to go its own way. Each person using their own genius. Same holds for art, same holds for science. It's not overseen by theology (as Marxism controls the artistic and scientific spheres, for instance, from within a political matrix). Luther believed in absolute freedom of inquiry. Many people think this is exactly what led to German ascendency in science. German universities, and the freedom of inquiry they maintained (at least up until the Nazis -- who traced their lineage back to pagan Rome and Greece, or at least to their imagined view of these cultures) were quite different than the Judeo-Christian sphere that they hated, and which they sought to exterminate (Christians, including Lutherans, were next after Jews, on Hitler's death list). You are quite close-minded and a little violent on this topic. But you are really so provincial on this topic. I think it's quite disingenuous of you to accuse ME of being "inflexible". It was you who laid down the Ten Commandments as a priori principles which MUST BE accepted, without any proof or other substantiation, before the fact of any consideration. That's called closed-mindedness, the same way the Medieval "scholars" behaved, INFLEXIBILITY, my man! You're not "against" science--you're just in favor of codes of behavior and conduct which guide us in favorable ways. I'm all for that too, but I'm not willing to deduce the justification of such codes from a religious doctrine cooked-up 2000 years ago. I want a scientific basis for doing so, one that takes into account the real facts and consequences of action. I.e., contraception doesn't cure AIDS, or prevent birth defects, but it's a hell of a lot better than prayer and abstinence at preventing infections and unwanted babies. I don't care what you think "God wants" in this instance, because you're just speculating. AIDS and unwanted babies are REAL problems, and there's a REAL SOLUTION. My mind is quite open, Kirby. So open in fact that I'd rather not close it up to fit into a specific church. I could actually talk to you about Jesus Christ and my relation to him, but granted you won't get anywhere with me when you start talking about dogma and the 10 commandments. The seedbearing core of all religions is personal mysticism, which can not be codified and institutionalized, and need not be. You've found your church. That's fine. If you want to think that Lutheranism can save the world, that's fine too. But none of it has any bearing on me. Which of the ten commandments don't you like? I think they are as real as brick walls. Break one of them (say, adultery, for instance), and it's like hitting a brick wall. Or try going against the commandment against stealing. You're likely to hit a brick wall in the frame of the law. Or killing. Kill somebody, and the guilt is as real as if you've hit a brick wall. Even hurt somebody, or hurt someone's reputation unfairly, and the guilt hurts you just as much as if you've hit a brick wall. It's not as if somebody just made these things up, is it, Curtis? They are as real as any actual wall. Do you really think they're not real? I don't know much about personal mysticism, Eddie. Jesus said that whenever "any two are gathered in my name" that it constitutes a church. I think you need two. Personal mysticism is ok by me, but I don't think it in any sense underlies the group experience at a functioning church. It's odd, though. Kierkegaard thought it was all about individualism. I find that very very strange. It's almost as strange as the modernist notion that writers should write purely for themselves. What a bizarre idea! It's as if people should dance all by themselves! There were certain strange scenes that I experienced in Seattle and in Olympia, where people were dancing all by themselves! I'd go into a rave, and people were just all self-absorbed, dancing by themselves. I can't imagine a church based on that. The whole notion of "do unto others" implies the importance of considering other people, as almost essential. I also think that writing should consider the reader, at least to some extent! It should even consider the COMMUNITY of readers, at least to some extent! You make a lot of assumptions, Kirby. If you kept going long enough you'd at least convince yourself that I'm a misanthropic loner sharing nothing with others, enriching no one else's life. Of course you'd never convince me of such a thing. You also lack some subtlety. Pure self-absorption can be appreciated by others, and can even enrich others. Don't ask me how that happens. I don't have a church to tell me how it does. But nevertheless it happens. That's only one small part of the spectrum, though. There are levels of self-absorption, levels of narcissism; as there are infinite levels and degrees of community. It's all sharing all the time, only different degrees of personal closure. I don't care about joining a church. I became a Catholic in my mid-20's, after being raised an unbaptized Baptist. Becoming a Catholic was a profound experience which did its work on me, and then ended, at least as a deliberate life practice. I happen to love watching people dance. An observer makes two. I think Kirby often exaggerates for a purpose--for instance, to provoke another poster into the open. That strategy can have value, as long as it isn't used indiscriminately, or too much. I think Kirby occasionally gives the impression that the only way he can hold to some of his principles is by pushing himself to an extremity which is radical. That tendency itself also is a two-edged sword: You could say that anyone who habitually challenges himself to the fire of temptation or controversy is being brave, or you could say he doesn't really expose his core beliefs because he's just playing at debate as if it were a game. Is Kirby an intellectual daredevil? There is nothing "nice" about Jeffers' view of 'nature.' Read his poems from 'Hurt Hawk' to you name it. Nature is wild, untamed, true to itself. Man moralizes, justifies. Man is part of nature? True. Man is apart from nature? True also. Hence, conflict. The resolution he finds is not an escape to "niceness." It is giving up the illusions of the human condition, the compulsory need to paper over the unpleasantness with religion and politics, e.g. "Make America Great (Again)." That he did this at a time of a popular war which some saw as the ultimate "Good vs. Evil" is a testimony to his existential strength. He didn't pick and choose. His view was final.